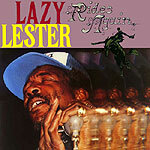 CD review: "Lazy Lester Rides Again"
Lazy Lester (Leslie Johnson) last last down an album over a generation ago. AT that time, his harmonica was helping to define Lightning Slim's sound. But when the partnership ended in '66, Lester effectively disappeared until the release of this album. The dozen tunes contained here were cut in Essex, England, with a supporting cast of British session players. Yet, with Lester's musical leadership and Mike Vernon's production, the result sounds as if it could have come out of Memphis or even the Delta. The music on "Rides Again" ranges from a traditional cover of W.C. Handy's "St Louis Blues," accompanied by steel guitar, to the doo wop shuffle, "Irene." Most of the tunes are covers, rather than originals by Lester. His harp style is lyrical and melodic; he may not have the range or drive of a Little Walter, but he gets emotion from each note. His solos on Jimmy Reed's "Can't Stand to See You Go" are classic examples of beauty through moderation. His nasal, almost whiney, vocals give his delivery a depth that transcends his limitations. Still, Lester is more likely to be remembered as a harpist than a singer. The band is competent, if not especially memorable. While they never seem to catch Lester's spirit, they at least don't hold him back. "Rides Again" ends with Lester on harp sans vocals, doing one of his few originals, "Lester's Shuffle." It's a solid return to recording from Lester, and worth tracking down for harp fans.